a decent smoky blended whisky imo ,never seen it at this price. All Single Malts are blended, unless they are single cask, they are just blended from the whisky produced by a single distillery. Blended whisky is made from whisky produced by a number of different distilleries - some are very good and very reasonably priced. Would this work with the £15 off voucher? Did your monocle fall into your cup of tea as soon as someone mentioned a blended whiskey? It's £11. For what it is, it is a bargain. Did your monocle fall into your cup of tea as soon as someone mentioned a … Did your monocle fall into your cup of tea as soon as someone mentioned a blended whiskey? It's £11. For what it is, it is a bargain. This is a value deal @ £11. Yes I suppose so, I used it last time. I didn't know the vouchers still existed. But blends in this price range are generally young, inferior quality malts that the producing distillery wouldn't put their own name on. This, I think, is made by Ardmore. Put them side by side and they would be miles apart in quality. £6 cheaper than Asda, £6.50 cheaper than Tesco and £3 quid cheaper than Morrison. Good find in my opinion. Will be stocking up with a couple of bottles for winter. Good enough to blend it with coke. Not anymore they've put up the price I hear!! if you're just going to mix it with coke anyway then this is great. Yes loads of cola Teachers whisky is rank!!! I'm not a whisky snob but I can't stomach Teachers. 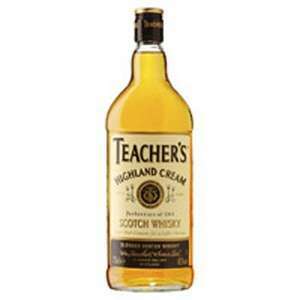 I do drink whisky but Teachers is just horrible doesn`t matter whether mixed or not, I would rather drink cheapest one from Aldi/Lidl. Have some heat for the price. Having finished off most a bottle of Jura Origin I can't see why anyone would automatically dismiss a blend like this.May even have more to it that Origin! They are fine for what they are. I mean how many drink Lapsang souchong or just 'Tetley'? Tetley is fine. HI, yes your right I heard it's good stuff for athletes foot.